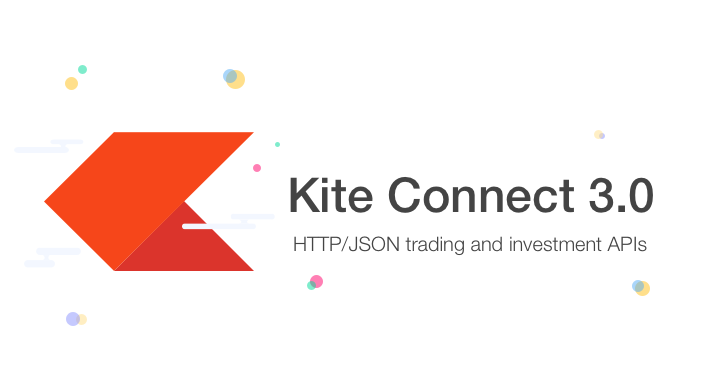 Kite Connect is a set of REST-like HTTP APIs that expose many capabilities required to build a complete stock market investment and trading platform. It lets you execute orders in real time (equities, commodities, mutual funds), manage user portfolios, stream live market data over WebSockets, and more. All inputs are form-encoded parameters and responses are JSON (apart from a couple exceptions). The responses may be Gzipped. Standard HTTP codes are used to indicate success and error states with accompanying JSON data. The API endpoints are not cross site request enabled, hence cannot be called directly from browsers. An api_key + api_secret pair is issued and you have to register a redirect url where a user is sent after the login flow. For mobile and desktop applications, there has to be a remote backend which does the handshake on behalf of the mobile app and the api_secret should never be embedded in the app. If you don't have a Kite Connect developer account, read more about it and signup here. Below is a list of pre-built client libraries for Kite Connect written in various programming languages that can be used used to interact with the APIs without having to make raw HTTP calls. Do note that the 3.0 version of these libraries on Github are in the kite3 branch. The current major stable version of the API is 3. All requests go to it by default. It is recommended that a specific version be requested explicity for production applications as major releases may break older implementations. Copyright © 2015 - 2018, Zerodha Technology Pvt. Ltd.